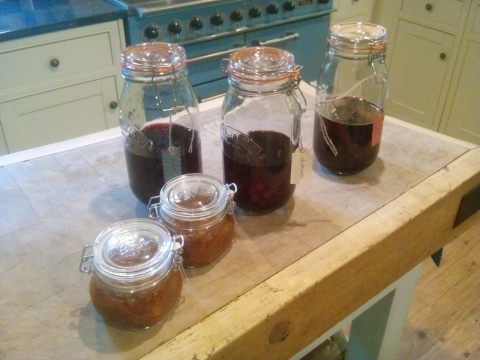 We were able to make only two small jars, but our green tomato chutney has also been maturing and should go very nicely with cheeses and cold meats during our festive feasting. 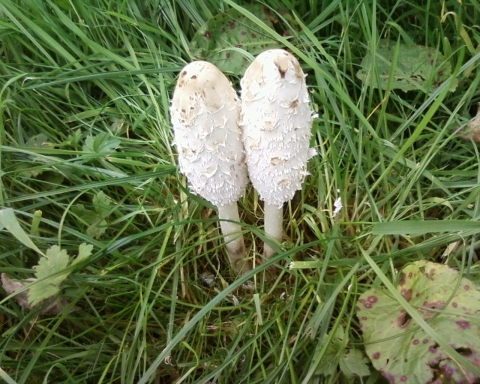 Autumn has seen, for the most part, unusually mild temperatures here in the UK, albeit a bit wet at times. Match that with, until recently, a lack of strong winds meaning the trees retained their leaves for longer than usual, and the result has been a spectacular display of autumn colour. We weren't sure if it was really a remarkable year for this seasonal display, or the fact that we have missed it for a number of years (the last real autumn colour we saw was in Brittany in 2010). From all accounts, it has been quite a special year for colour and our immediate surroundings abound with the glorious yellows, oranges and reds as you can see from the video below taken on the road between Avening and Nailsworth. Although we're spoilt by such beautiful colour right on our doorstep, a visit to Westonbirt was a must. Westonbirt is the Foresty Commission's National Arboretum and boasts an amazing collection of trees. Seeing the Japanese maples in their autumn finery is a justifiably popular tourist attraction, drawing visitors and avid photographers from around the world, so we weren't surprised that it was reasonably busy when we made the short journey there on a dry Saturday in mid October. Due to the mild weather, many of the deciduous trees still retained green in their foliage, but I think out timing for the best of the colour was about perfect. 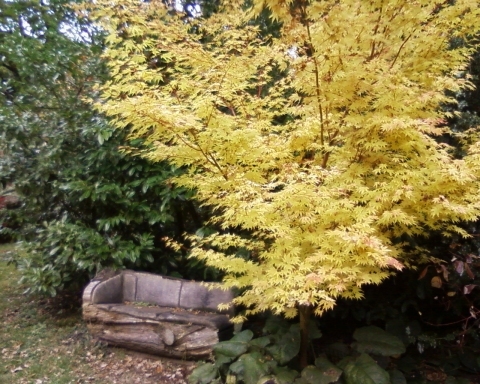 Far from the best photo as it was taken with a very old phone, but gives you the impression of the beautiful colours at Westonbirt. 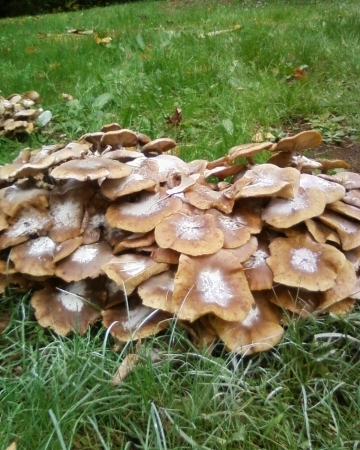 There were also several varieties of fungi at Westonbirt. Like trees with unusual shapes, I can't resist taking photos of these fascinating organisms. A couple of storms with very strong winds finally stripped the trees of their leaves, depositing them in the gutters, on the conservatory roof, on the gravel drive and all over the garden. Not quite so pretty now... Despite Andy buying two other new toys, sorry, crucial pieces of equipment in the form of a leaf blower and a water fed extendable conservatory cleaning brush, the wet weather meant that most of the leaves remained while we waited for a dry weekend to tackle them. Before the first big fall of leaves, we did manage a day cleaning the conservatory roof, even though it was leaf strewn again by the next day, reminding us of spending hours cleaning red or brown sand off the coachroof and deck of Pipit to find sand filled rain falling again the next day. We finally got a dry day one Saturday and spent several satisfying hours clearing leaves, washing the terracotta pots and storing them in the shed ready for next spring and doing some general tidying in the garden. The mild weather has some of the plants very confused - there are buds on trees, including the little magnolia, and one of the shrubs that has lost its leaves for the winter is starting to flower! We have had only a few frosty mornings so I hope when it gets colder, they survive ok.
We've put a variety of bird feeders around the garden, offering our avian visitors a choice of mixed seed, peanuts and suet balls. They seem particularly keen on the seed, working their way through an entire feeder full in less than a day. Having said that, they do seem to 'spill' almost as much as they munch, so I'm working on an adaptation to the feeder which will see a plastic garden pot saucer glued under the feeder to catch all the spillage which I hope they will then continue to eat. The seed that currently spills onto the ground does get nibbled at, but I guess the temptation for an easy beak full from the feeder has more appeal than pecking around on the ground. The spilled seed also seems to be sprouting, so I need to get in there to clear it up. 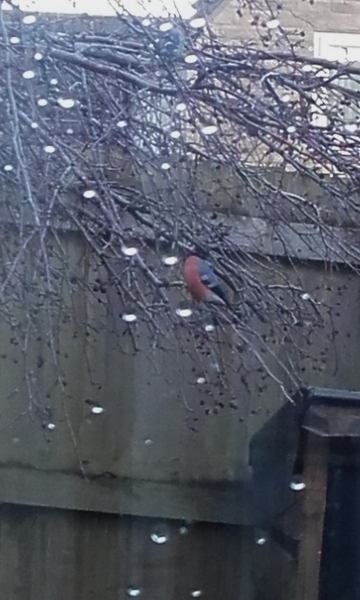 Mr Bullfinch - Mrs Bullfinch was there too, but photographing with my phone through the raindrop covered conservatory glass didn't offer the best composition options. Enjoying the autumn colours and watching the birds in the garden may seem sedate pastimes, given our last 5 years living the cruising life, but we both love the simple things in life. We've been busy working too, not just through weekdays, but often in the evenings and weekends. It makes for a very hectic life, but we are both enjoying the combination of mental stimulation and satisfaction with jobs with which clients are very pleased. Over the last few months, we have re-developed and taken over the maintenance of the website of yacht charter and brokerage business, Liberty Yachts, for our friend Simon in Plymouth who owns the business. He'd had a new website designed, but wasn't getting the support he needed to maintain it and there were also several issues with the website with which he wasn't happy and felt the website wasn't a good or true reflection of his business. We're also not far off releasing another new website for a business in Nailsworth - watch this space! I am also doing some volunteer work for the WWT (Wildfowl & Wetlands Trust). I compile news summaries which are circulated to trustees and senior management at their nine centres around the UK, so that they are aware of how the WWT is appearing in the news. The summaries also include relevant media coverage of important conservation, environment or climate news. This is on behalf of the Slimbridge HQ PR Department but something I do from my office here at home, so the commute is no problem! The feedback on my efforts has been very positive and I am enjoying it, learning quite a lot as I read the various articles. Busy as we have been, Christmas seems to have crept very quickly and my planning isn't quite as far advanced as I'd like, but I hope to have more time to concentrate on that this week. Having said that, it was half way through the week already when I was finishing writing this for publication on Friday! 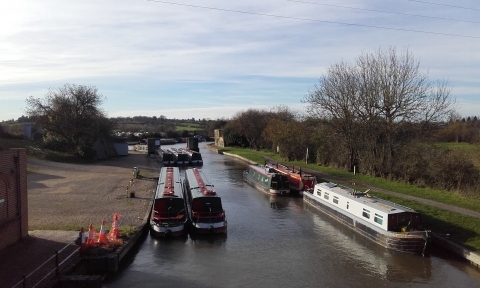 It's not all work though, we have had some lovely walks, including one along the towpath at Devizes, past the iconic Caen Hill flight of locks. It was a lovely clear day, but with a very fresh & chill wind. 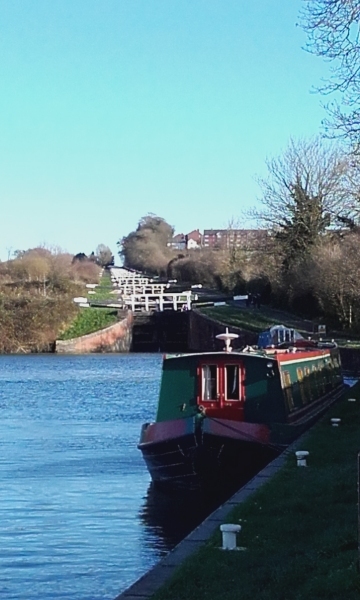 There are 29 locks in total at Devizes - the photo below is of the 16 that form the steep section of the main flight. The locks are part of the Kennet & Avon Canal which runs from Bristol to Reading with 105 locks along the length of the waterway. For those interested in the history, you can read more here. The main flight at locks at Caen Hill. 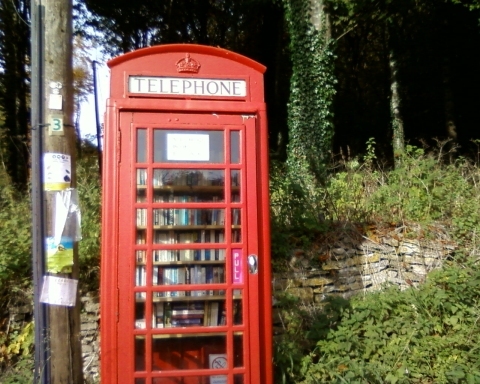 We've seen many book exchanges during our cruising travels, mostly in marinas, but this is definitely the most unusual! So, dear friends, time to begin preparations for Christmas in the Cotswolds. The goose has been ordered, just the remaining shopping, decorating, baking and meal planning to do then... Best wishes to you all for a wonderful Christmas and New Year.